Funny. Everytime I switch to "2" I can never get a response from the TM's back there. That must mean the store I worked at was a greatland at one point in time..
For the past few months, every time we have more than 1 walkie in the backroom, the goddamn LOD takes them all until we have only one. Because the floor needs them all. Except that doesn't work, because they announce EVERY SINGLE THING on the overhead PA anyway when trying to communicate things across the floor. It's extremely f***ing ghetto. We aren't Walmart. Or Kmart. Our backroom people end up losing their walkies to the floor, but we don't announce things on the overhead. 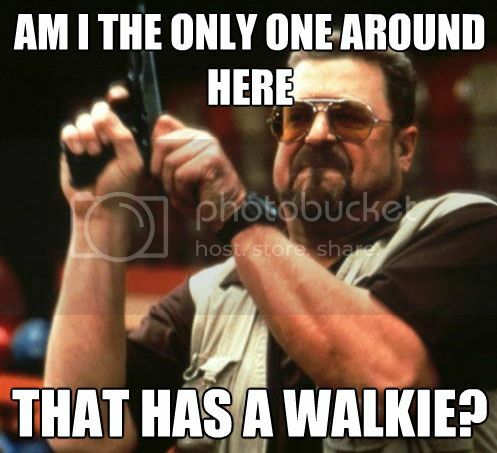 I cannot tell you how frustrating it is to come in to open guest service and have to fight for a walkie. 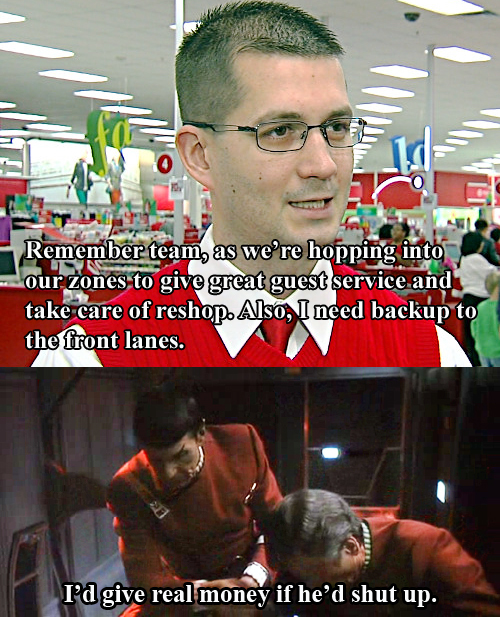 First the GSTL will ask nicely...and everyone assumes that someone has given theirs up. Usually by the second or third phone call when I'm hunting down the GSTL to ask them to call out the call, they start getting serious about wrestling away the walkie from someone else. Our electronics TM wasted 15 minutes at the start of their shift the other day trying to get people to give up their walkie and pda. Has anyone else seen this one online? So i was wondering why i stepped into my old spot store for beer and a sandwich and my favorite gstl had to call a number lol.. Wait...what...all we could do was apologize, give them 5% as a target coupon and ask for an alternative method of payment. There was no place to ask for an override at the registers. Some propmpted at my store idk how. Our store was initially all prompts so we could just type in the code located at K4 (gstl) K5 (emergency override code). As the CSC was fixing it they all transitioned to declines. You know it's bad when they activate the code! Ah...I was on lunch when this started...so the cashiers were sending all the guests to GS to complain and get their 5% there. It took my GSTL 20 minutes to get out from behind GS to tell the cashiers that the system is down, give the guests the 5%, ask them to pay another way and stop sending them to guest services for that. I was in early to pick up lens cleaner at optical. First it wouldn't take my debit and then my credit. It wasn't until I heard the gstl say it was down and was global that I realized it wasn't me. Had me worried for a second there. I was only about a dollar difference between with employee discount and without. Luckily it was back up by the time I had clocked out and picked up some stuff before I went home about 7:30.
well crap. that was a repost. Let's try this again. I went old school and wrote a check so I could still use my TM discount. I didn't have my check book on me, so I made them do a "fix a mistake" later to pay a different way. Also applies to pallet jacks and flats. The emergency code (when active) will let you override a refund/return without having to call 718 (refund auth). I've only seen the code activated once, and it was because our receipts didn't work lol.